Green energy development and transitioning British Columbia to the vision of being a green energy powerhouse are priorities for the Government of British Columbia as reflected in the BC Energy Plan and the Climate Action Strategy. 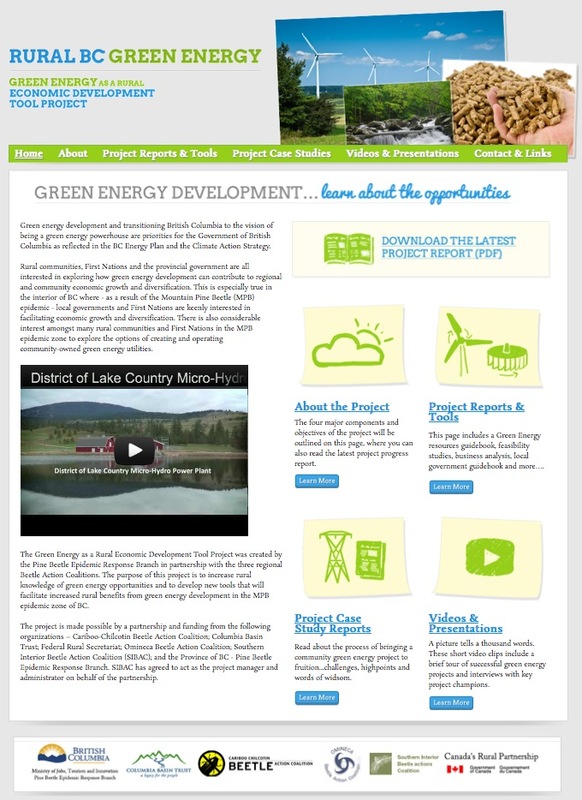 The Green Energy as a Rural Economic Development Tool Project was created by the Pine Beetle Epidemic Response Branch in partnership with the three regional Beetle Action Coalitions. The purpose of this project is to increase rural knowledge of green energy opportunities and to develop new tools that will facilitate increased rural benefits from green energy development in the MPB epidemic zone of BC. Chris Wheeler Media is producing a series of videos for the Southern Interior Beetle Action Coalition (SIBAC) and the Province of BC that showcases successful micro-hydro power projects. The first video highlights the District of Lake Country’s Micro-Hydro Power Plant that uses existing infrastructure to develop a sustainable, green energy project that takes care of the municipality now and into the future.